How wonderful it would be if budding scientists could go back in time and interview great scientific minds about what they were most passionate about and how they drew their conclusions. Now there’s a way. The new picture book called Eureka! 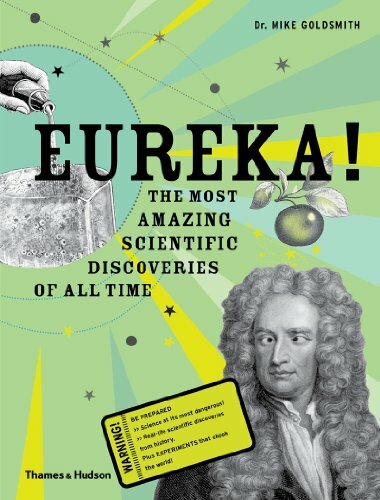 The Most Amazing Scientific Discoveries of All Time by Dr. Mike Goldsmith is the perfect way to conduct a retro-interview with the science greats. Eureka! introduces young readers to the likes of Louis Pasteur, Charles Darwin, Marie Curie, and Edwin Hubble. Young scientists can peruse early photographs, read what was on each scientist’s mind at the time he or she formed a hypothesis, and even relive their early methods and investigations. The book presents the scientists according to their interest. For example, there are sections on medicine, the human body, matter and energy, planet earth, and the universe. There is also an extensive glossary and a meticulous index to help students find scientists by name or subject matter. Each section includes wonderfully odd tidbits for the budding scientist, like how Antonie Van Leeuwenhoeck (inventor of the magnifying glass) allowed lice to breed on his legs so he could study them, how Louis Pasteur drew fresh saliva from the jaws of rabid dogs in order to concoct a treatment, and how William Harvey cut up the dead bodies of deer and other animals to learn how the heart supplies blood to the body. This action-packed, gore-filled book is not for the faint-of-heart—but then, science has never been for the squeamish. There are photos, drawings, and paintings of science pioneers and their vintage equipment. There are also scientific surprises sprinkled throughout, like the tidbit about how surgeon Richard Owen took a deceased prisoner’s head home to conduct closer study. Teachers, scientists, and students from the elementary ages to young adult should love this extremely well-written and fact-filled book.